Lovingly referred to as the jewel of America’s national park system, Yosemite is home to the country’s most iconic natural treasures. Half Dome, El Capitan, Tuolumne Meadows, Fire Falls, The Valley … these legendary natural monuments draw millions of visitors each year. For some, a visit to Yosemite National Park is a time for reconnecting with Pachamama (Mother Earth). For others, it’s an opportunity to test their physical prowess with intense hikes and mountain climbing. Whatever your reasons for visiting, August is a wonderful time to be in Yosemite. Here are 28 photos to show why! Visiting Yosemite is a right of passage for hikers, nature lovers and photographers alike. With its majestic granite peaks, sweeping meadows, babbling brooks, powerful waterfalls and ancient redwood trees kissing the heavens, it truly is America’s Greatest Treasure. For tens of thousands of years, humans have changed, and have been changed by, this place we now call Yosemite. The Ahwahneechee lived here for generations, followed by the arrival of Europeans in the mid-1800s. The rugged terrain challenged many early European travelers, with just a few—only 650 from the mid-1850s to mid-1860s—making the journey to Yosemite Valley by horseback or stage. By 1907, construction of the Yosemite Valley Railroad from Merced to El Portal eased the journey, thereby, increasing visitation. 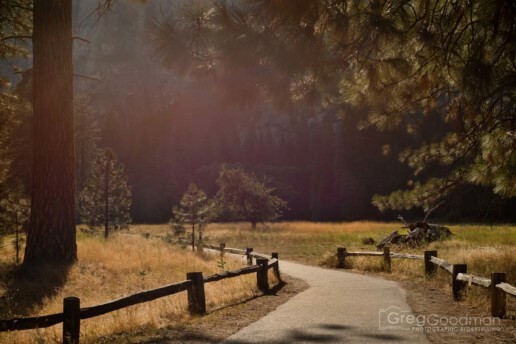 Today, about 4 million people enter the park’s gates to explore Yosemite. We can learn from the stories of those who walked Yosemite’s trails before us and honor the echoes of their distant footsteps that have led to conscious preservation. When early morning sunlight beams through the trees and mixes with campfire smoke, the results are spectacular! Winter. Spring. Summer. Fall. There’s no “wrong” time to visit Yosemite. During the colder months, you’ll find solitude while visiting the park’s most beautiful and iconic locations. Spring brings melting snow, rushing rivers and thunderous waterfalls … while summer brings lush greenery, open trails and a full roster of wildlife. For those heading to Yosemite Valley during the fall, be prepared to ooh and aah at the incredible foliage. Then, grab your tire chains and get ready for a snowy winter, as the circle of life and seasons begins once again. If you were wondering, all the photos on this page were all created while visiting Yosemite National Park in August. While visiting the Tunnel View lookout point, most visitors point their cameras at Yosemite Valley. However, there is plenty of spectacular natural beauty for those who simply turn around. Ten years and many amazing adventures later, Ricky called me out of the blue and asked what we were doing. It turns out he was visiting California and wanted to go to Yosemite. Naturally, we said yes! Despite arriving in Yosemite National Park in August with no camping reservations, we managed to find a spot opening up right as we arrived at the Bridalveil Campsite. This was truly a stroke of luck and fate, as most campsites are booked months in advance. For three days, Ricky and I photographed as much of Yosemite as we could. Well, I photographed … Ricky focused on time-lapse photography. Now, I invite you to check out his absolutely amazing time-lapse video of Yosemite – featuring full moons, sunrises, sunsets, stars, nature and more! The hike itself is an exciting, arduous, humbling, breathtaking and epic experience. When I did it in 2010, the round trip took nearly eight hours. By the end, I was walking downhill backward … just to relieve some of the pressure on my legs. Photographing Half Dome is a much easier task. Though, with more than 100 years of photographers pointing their lens at the mighty granite crest, it can be difficult to create something original. Should you be up for the challenge, August is a great time to photograph Yosemite and Half Dome. From Glacier Point (one of Yosemite’s most popular and accessible destinations), the sun rises directly behind Half Dome, providing a spectacular view and a great chance for silhouettes and sunbursts. If you don’t want to get up early, the sunset is also picture perfect, as it covers the face of Half Dome with a rosy hue before dipping behind the mountains. The biggest curve in Yosemite comes just before reaching Glacier Point. It's a wonder people don't get distracted by Half Dome and drive right off the cliff! When the moon is full, Yosemite’s gray granite peaks glow in the bright lunar light. While that brilliance makes it a bit harder to see the stars in the early parts of the evening, our vast solar system comes into full view by the middle of the night. The final photographs on this page were created during such a full moon evening at Yosemite National Park in August.